This hotel is quite a landmark, the first hotel to be built by the Victoria Falls. The elegant building dates back to the turn of the 20th century and its colonial charm combines well with 21st century comforts, making it a popular choice for those visiting the famous Falls. As soon as you step through the wide doorway you're transported back to a bygone era. High ceilings, long corridors, elegantly proportioned rooms, walls covered in paintings and photographs evoke an old world atmosphere. There are no fewer than three restaurants to choose between, offering indoor and outdoor dining, not forgetting high tea served on the Stanley Terrace each afternoon. There are lounges, reading rooms and a library, while outside you'll find the lovely swimming pool, a great way to cool off on a hot day. The grandeur of the building is matched by the beautifully maintained gardens, where you'll catch glimpses of spray from the falls and can wander down to the entrance of the rainforest in a matter of minutes. The hotel is also close to Victoria Falls town and staying here you'll have access to all the many activities on offer. There are several accommodation options, from standard rooms up to the royal suite. Though they vary is size and facilities, all are air conditioned, have an en-suite bathroom, satellite TV, phone and safe, and you'll be able to start the day with a cup of tea of coffee, brought by the attentive staff. Open: Victoria Falls Hotel is open all year. 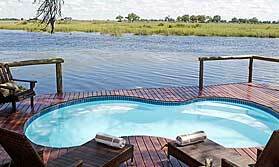 Location: Victoria Falls Hotel in its own extensive gardens, a short walk from the falls after which it’s named. It is close to the town of Victoria Falls. It is about a 10-minute walk to the Victoria Falls rainforest. Rooms: There are 180 rooms in total, including 37 standard, 58 traditional and 48 deluxe rooms including 2 interconnecting rooms. 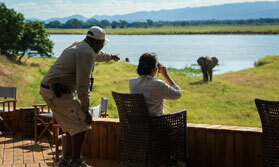 There are also 7 junior suites, 4 honeymoon and the prestigious royal suite. All are en-suite and have full air conditioning, TV, telephone and safe. Deluxe rooms and suites also have a minibar. Activities: There is a huge choice of activities. Walking in the rainforest, take a cruise on the Zambezi River, go for an elephant back safari or hop on the steam train from the station behind the hotel to the old Vic Falls bridge. There are also some adrenalin-charged activities such as a helicopter or microlight flight over the Falls, white water rafting and bungee jumping off the Vic Falls bridge. All these activities can be arranged and paid for at the dedicated activity desks in the hotel. Facilities: There are 3 restaurants. The Livingstone Room serves a la carte meals in a refined atmosphere, Jungle Junction by the pool specialises in African fusion food and Stanley’s Terrace is the venue for light meals and afternoon tea. The hotel offers 24-hour room service and packed lunches. There is a choice of lounges and reading rooms, a library, chapel, curio shop, hair salon and beauty therapist. The hotel has an outdoor swimming pool in the attractive gardens. There is a laundry service. Dining: Meals are served at individual tables, in the venue of your choice. Children: Children of all ages are welcome. There are 2 sets of interconnecting rooms for families, and cots are available for infants under the age of 2 years. Communication: There is Wi-Fi internet access throughout the hotel. "Fantastic colonial hotel with wonderful views. The staff were very attentive we were treated to old fashioned luxury. The only downside was the swimming pool which was very cold." "Iconic hotel - beautiful view. One minus however regarding the service associated to the stable wing - where we stayed: the price for these rooms include a dedicated team to welcome us, arrange requests, etc. They have been really bad for the check-out, as they tried to "force" us to leave the room at 10, although they told us when arriving that they would arrange a late check-out for us, as we were due to be picked-up at 1 pm. They finally found out a solution, but after one hour of a mess. Let's say that comunication amongst team members could have been better! "